November 3, 2015: Katonah, NY – The Katonah Museum of Art will present Los Angeles-based artist Aaron Curry’s UGLY MESS on the Museum’s South Lawn starting November 27 through June 19, 2016. Curry’s artworks fuse his interests in the sculptures of Modernist artists such as Pablo Picasso, Henry Moore, and Alexander Calder with his personal experiences of 1980’s mass media, and skating and graffiti culture. This single-artwork exhibition is organized by Katonah Museum of Art Associate Curator, Elizabeth Rooklidge. Composed of a single plane of aluminum painted with bright colors in a cartoon-like manner, UGLY MESS is an abstract, surreal sculpture that operates on the boundaries between modern and contemporary, painting and sculpture, the geometric and figuration. The bright yellow surface of the sculpture is “tagged” with lines and drips of bright orange, blue, green, purple, and red paint. While the height of the work renders it formidable to the viewer, the bright colors as well as its anthropomorphic shape, reminiscent of the slumped figure of a crying creature, humanizes the 18 ft. tall aluminum sculpture. Aaron Curry (born 1972) is a Texas-native, living and working in Los Angeles, CA. A 2010 fellow at the American Academy in Berlin, the artist graduated with his BFA from the Art Institute of Chicago and later received an MFA from the Art Center College of Design in Pasadena, CA. Curry has exhibited in the United States, Asia, and Europe. 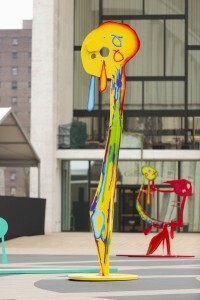 His latest solo exhibition (2013) featured UGLY MESS along with 13 other sculptures installed at the Lincoln Center Plaza in Manhattan, NY. Support for this exhibition was generously provided by Joshua and Sara Slocum. The Katonah Museum of Art is supported in part by Arts Westchester with support by the Westchester County Government, The New York State Council on the Arts with support of Governor Andrew Cuomo and the New York State Legislature. This entry was posted in Exhibition and tagged Aaron Curry, Contemporary, Modernist, sculpture, South Lawn. Bookmark the permalink.